Shalt such fever ever last; what lonesome horizon to ignite. Done with twilights that brim with thrushes. Done with cold calls. Done with formalities. Done with potlucks . . . . Done with illustrated guides. Out on the frozen Bodden river, the iceboat skims the clean white scale of erasure: the absence of horizon: the expanse. There is white, and there is white so white it is blue. Sandra Beasley, in her review of Sum of Every Lost Ship in Blackbird v9n2, suggested that Titus might be categorized an “elliptical poet,” in an allusion to the poet and critic Stephen Burt’s use of this term to denote those who “treat voice and self and identity neither as givens nor as illusions, but as problems, phenomena, [that] poems can explore and limn.” This categorization seems apt, considering Sum of Every Lost Ship’s range of voice and address, from a sequence titled “Instructions from the Narwhal,” drawn from an earlier chapbook of the same title and including that creature’s lyrical ruminations on such topics as “How to harvest ice” and “How to ruin the ending,” to another sequence purporting to be “From the Lost Diary of Anna Anderson,” inspired by the biography of the real-life Anderson, who claimed to be the escaped Grand Duchess Anastasia Romanova of Russia until her death in 1984. Titus’s collection finds great success in its engagement with all manner of speakers and subjects, and the three focal characters of The Arsonist’s Song—Vivian, her neighbor-turned-lover Ronny, and the sinister Doctor who invites Ronny to become a part of a top secret experiment at the hospital where both work—seem themselves to defy the constraints of realistic “givens” or the orderly “illusions” found in most literary fiction. Titus’s characters are most engrossing when they appear alone in scene, each defined by their unique history and obsessions, untroubled by the demands other characters or forces make of them. Really, what it came down to was the peculiar deficiency of not understanding how to be known by anyone. She didn’t want to give too much away. . . . How could a person stand to always be seen desiring, and taking. Not just food, either—anything coveted. To Viv, every kind of hunger felt vulgar, and that was an embarrassing kind of shame. Several pages of narration in the Doctor’s theatrical circumlocution and pseudoscientific bluster finally arrive at the disclosure of the true nature of the project: the Doctor seeks to design and test a radical new design for wings to be surgically grafted onto the human frame—specifically, Ronny’s—ushering in a new era of possibility, “a re-envisioning of the human condition.” The character of the Doctor, with his hazy background, ambiguous motives and ornate, antiquated forms of address, seems lifted out of a German Expressionist film, an interesting decision which proves somewhat discordant when the Doctor encounters resistance to his project from hospital authorities, the mundane facts of official censures and meetings with the Board, as well as from Ronny, whose voice and impressions come from the same grittily realistic (if somewhat poetically charged) world as Vivian. The result of this discord is that the reader accepts the idea of human flight as a charged and resonant symbol in the novel—and indeed, the source of some of Titus’s most arresting images—but at the cost of the vital illusion that the more grounded moments of the narrative still seem aimed at perpetuating. The story of Icarus comprises yet another present absence here, bleeding through Titus’s lines and enriching the reader’s sense of the questions she poses: Which of these three main characters is guilty of the most hubris, and which of them has the farthest to fall? “After everything, there could be only one possible outcome,” a character reflects late in The Arsonist’s Song. The true mark of Titus’s accomplishment is that the novel’s breathless conclusion has it both ways, surprising the reader at the same time as conveying the sense that an inevitable cycle has been completed. Afterward the reader may see Titus as an authorial incarnation of the Doctor, conducting a sort of symbolic exercise, moving her test subjects through a series of trials, inviting us to submit to her persuasive arguments; for isn’t it perfectly logical, Titus seems to ask, that in every fever dream of flight is also embedded our secret desire to fall? Allison Titus is the author of two books of poems: The True Book of Animal Homes (forthcoming from Saturnalia Press in 2017) and Sum of Every Lost Ship (Cleveland State University Poetry Center, 2010). 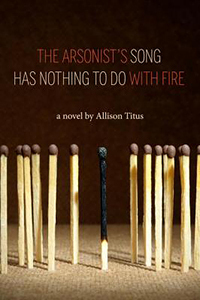 The Arsonist’s Song Has Nothing to Do with Fire (Etruscan Press, 2014) is her first novel. Her chapbook, Instructions from the Narwhal (Bateau Press, 2007), won the BOOM Chapbook Prize. Her work has been published in Blackbird, Boston Review, Tin House, Gulf Coast, and Denver Quarterly, among others. She was the recipient of a 2011 literature fellowship in creative writing from the National Endowment for the Arts. Titus is coeditor of the poetry journal Handsome.